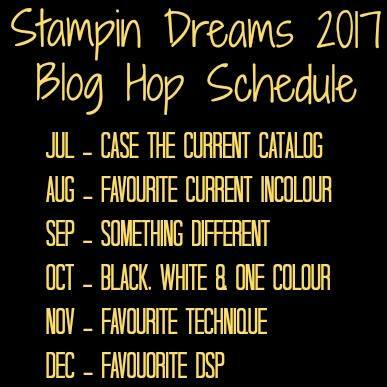 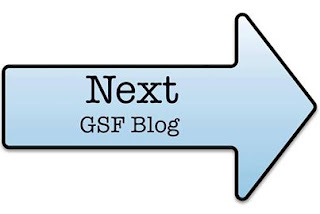 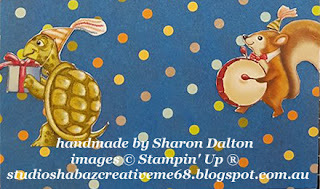 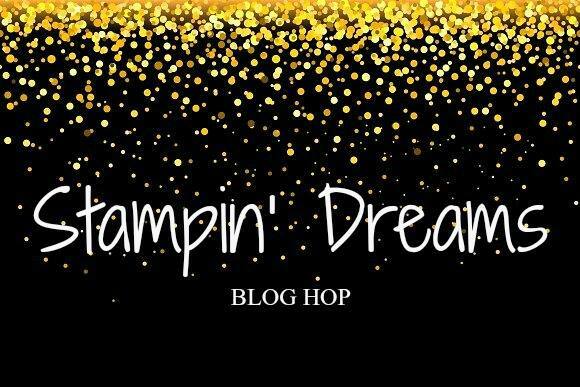 Well Hello everyone, Welcome to Stampin Dreams Blog Hop - Case the Catalog. 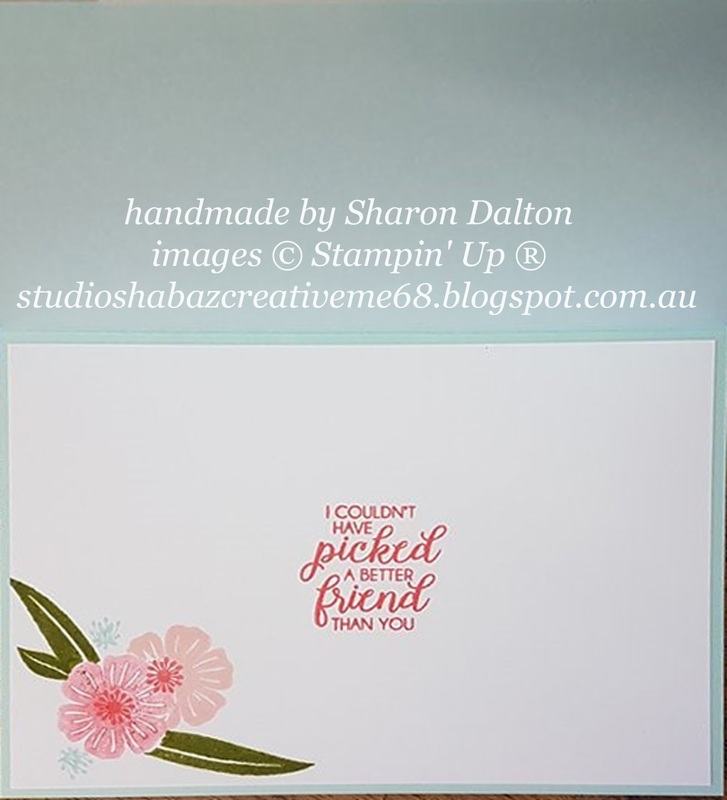 I wanted to use a set that I didn't actually own after scouring the catalogue, luckily for me one of my friends in my team had the whole suite....So I asked kindly and she allowed me to make my 'CASE'.... 'CASE'ing can be very broad, you can just use the colour scheme, you can make exactly the same project or you and make your own variation using elements from the project. 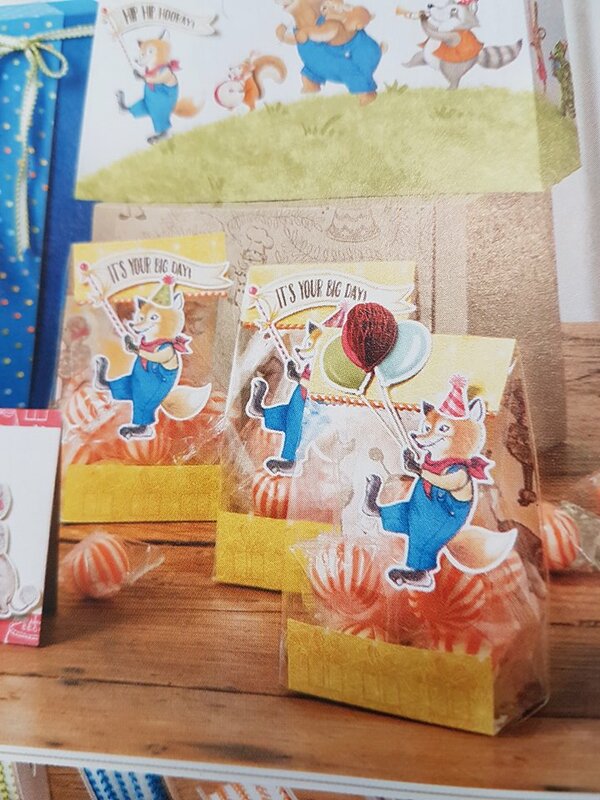 Check out pages 68 &69 for everything that is Birthday Memories Suite. 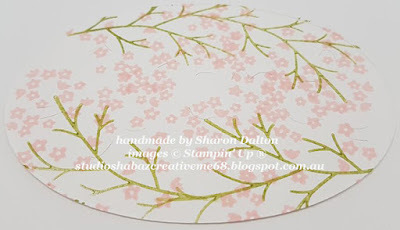 As I said I didn't own this suite so I was very cautious about cutting up this beautiful paper. 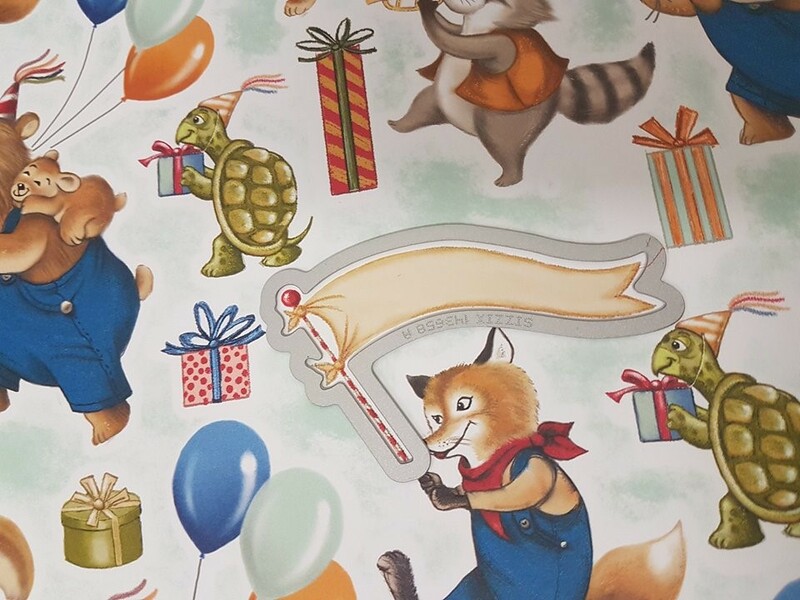 Thankfully this suite also has Dies - Birthday Friends Framelits. 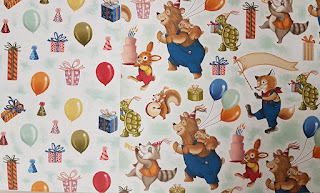 So not much fussy cutting for me...except I loved the turtle and the lil squirrel so I had to cut them by hand. 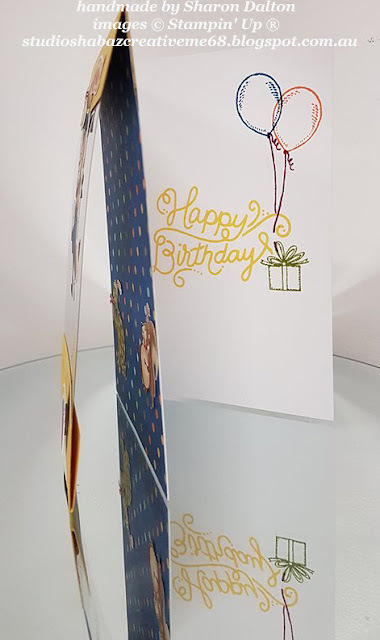 I decided to just make a card from the gift bag idea, BUT mine has a see through flap at the front so like the bag you could see behind it. 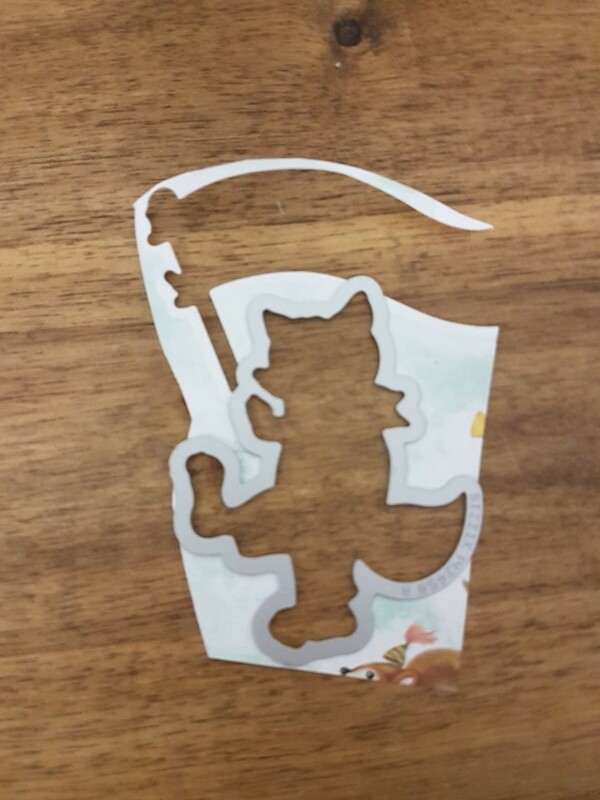 Do you see what I mean now??? 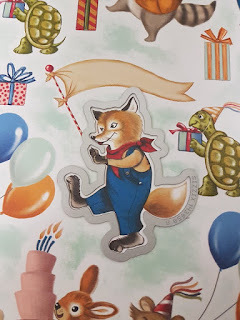 I added a Mr Fox on the front of piece of window sheet with some Daffodil Delight cardstock at the top and bottom. 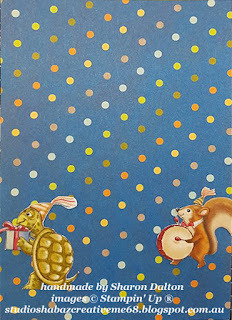 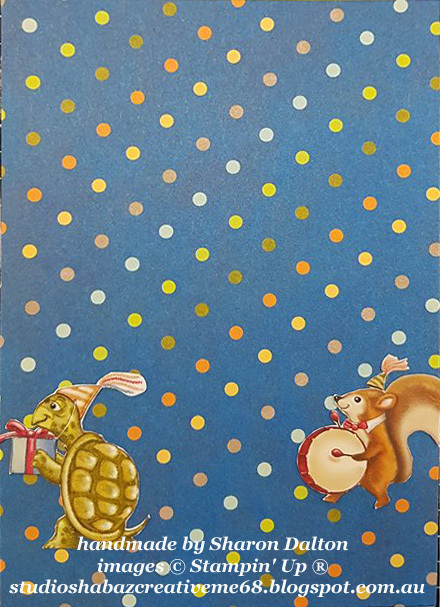 Behind the flap I added a piece of matching DSP from Birthday Memories Designer Series Paper with our turtle and squirrel. 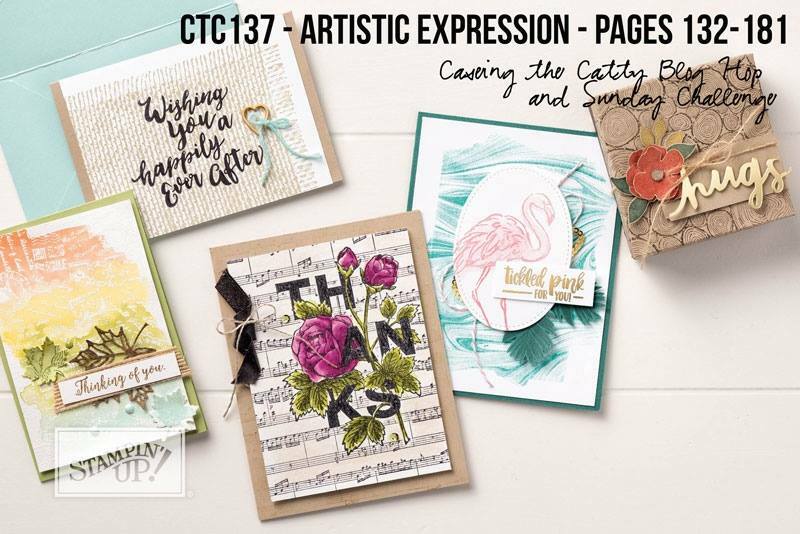 I have been endeavoring to participate in one for a while, BUT time just seems to escape me every week...This week I took a quick look through those pages, WOW so many beautiful examples to case. BUT this just hit me in the face and said do this one!!! So to participate in Caseing the Catty you can CASE directly or be inspired by a sketch/layout, colour combo or embellishment. So not having this stamp set I thought which one do I have that is similar - Beautiful Bouquet pg 92 had a similar flower. Here is how I did this..I simply stamped the flower image on some photo copy paper and cut it out by hand yes!!! 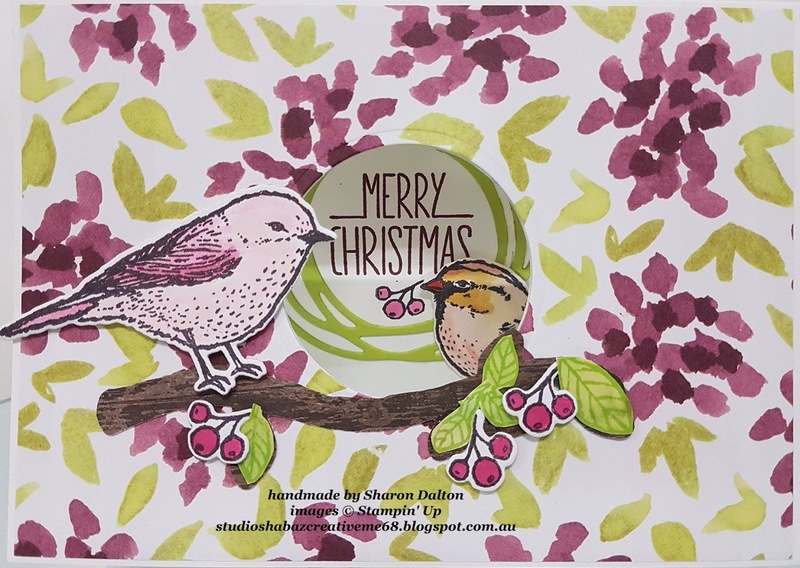 by hand. 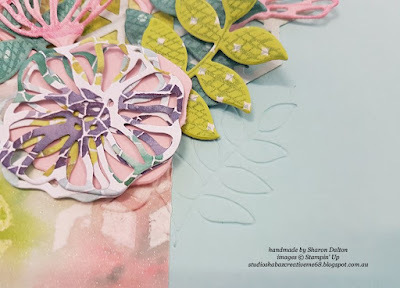 Who else loves fussy cutting....it is so relaxing!!! Then I placed the stamped image over my original flower to cover it (see on the left hand side) and then stamped my leaves in Old Olive, once you remove your flower mask it reveals the leaves behind the flower (see on the right hand side). 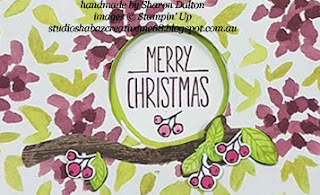 Sorry my photos are not the best!! Now we were up to the fun part, adding all the details. 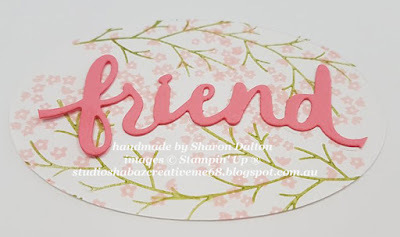 I felt it needed this done behind the word Friend and then I also felt it needed a Flirty Flamingo Friend....YES!!! 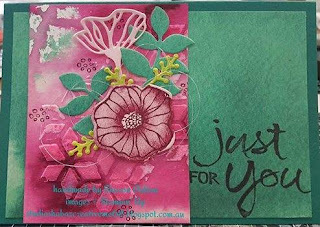 I do tend to overthink it and YES!!! I proCRAFTinate a lot!!! 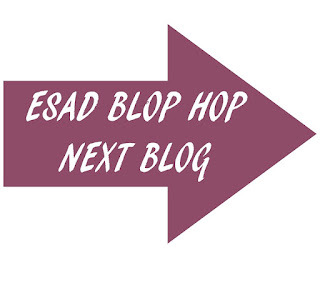 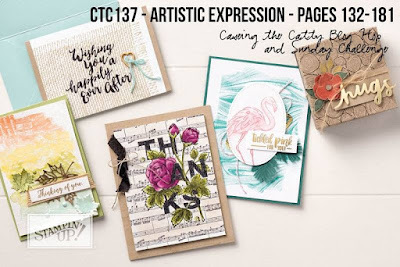 If you want to have a look at the Blog Hop from the Caseing the Catty Crew Members, start here with Elizabeth Gross and her Hugs sample. Stampin' Up demonstrators out there. 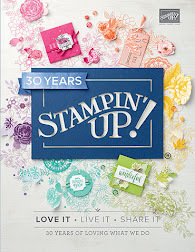 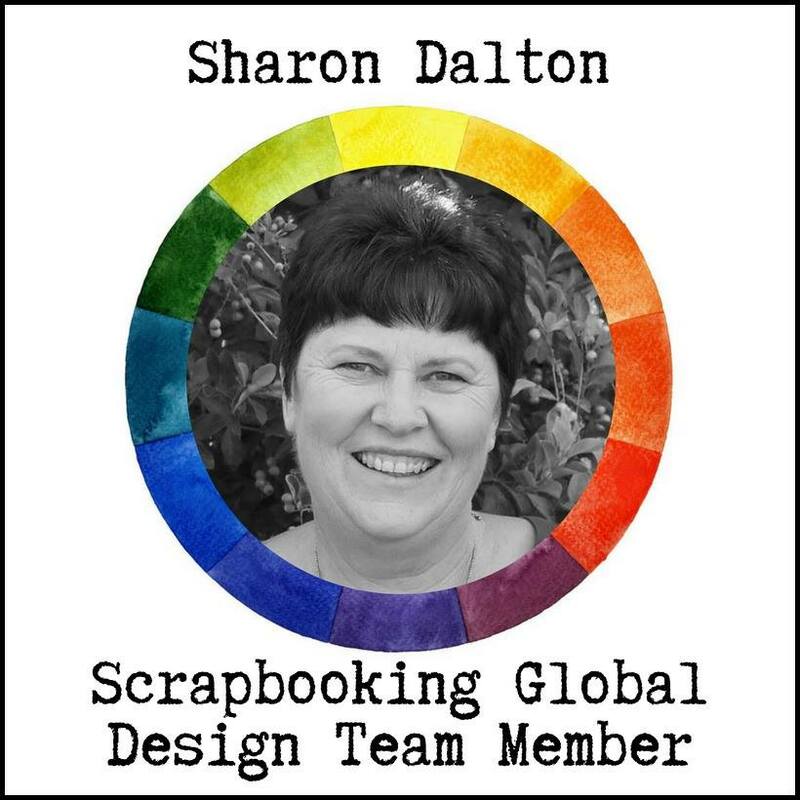 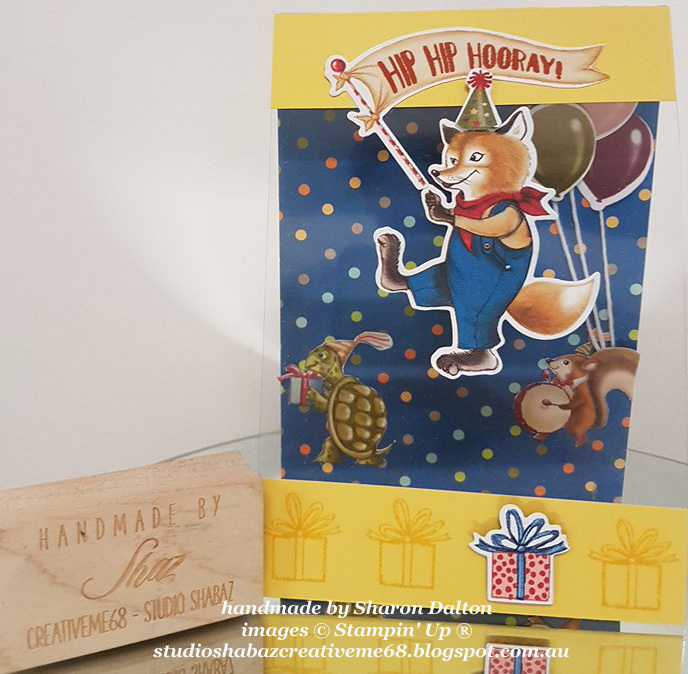 Welcome everyone, This ESAD Blog Hop excites me as I got to play with my very favourite suite in the whole entire 2017-2018 Annual Stampin' Up catalogue... 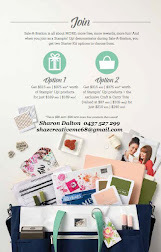 If you follow me here or on FB's many groups I am in you will have probably guessed which suite I will be using. 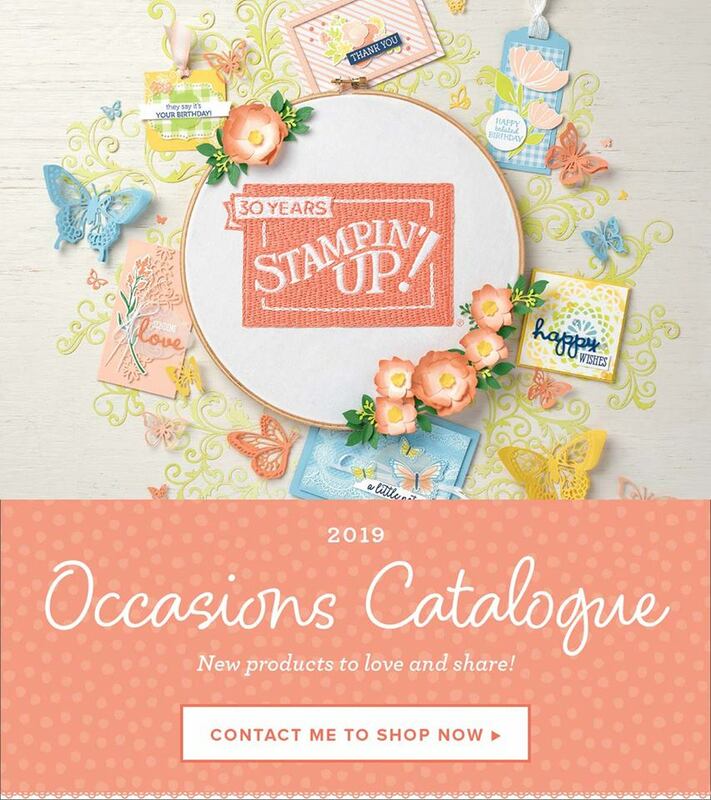 My absolute favourite products from the 2017-2018 Annual Catalogue would have to be the Naturally Eclectic Suite on page 132. 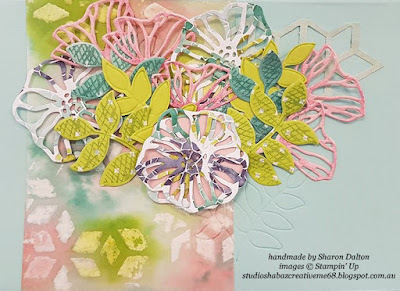 The stunning samples caught my eye immediately as soon as I saw them. 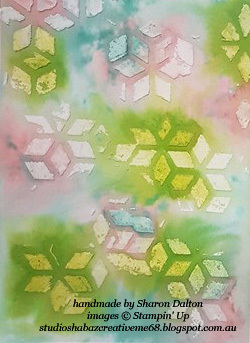 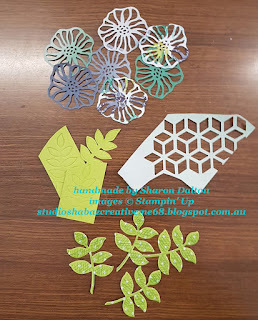 I had all of these cutouts and this background, that created with embossing paste. So with these pieces I wanted to create a Happy Birthday card for my Sister in law. So can you see why it is my favourite, Do you like it too??? 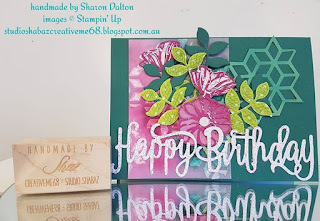 Up next is Leonie Schroder , Leonie is a Stampin' Up Demonstrator from Sydney. 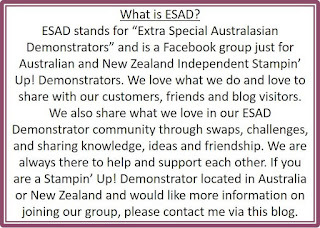 the world....Thanks for the warm welcome into this group Sarah McDermott. 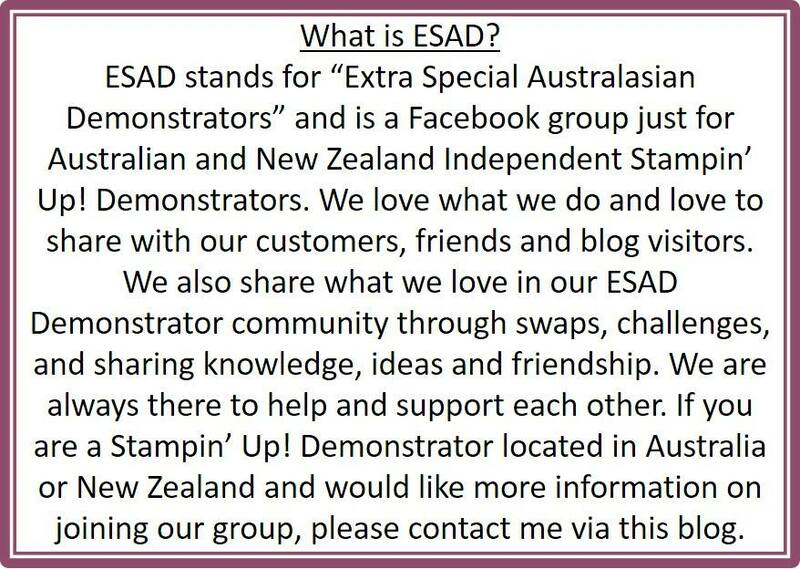 I am here in Australia!!! Very excited until I saw this month's brief....I am not very good at thinking outside the square....Holidays in July - with a twist made my head hurt to begin with!!! 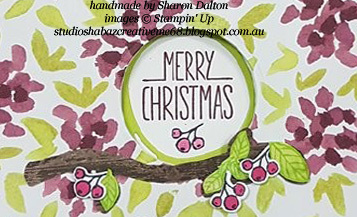 So the brief was to design a holiday project BUT using a set that isn't designed specifically for holidays. 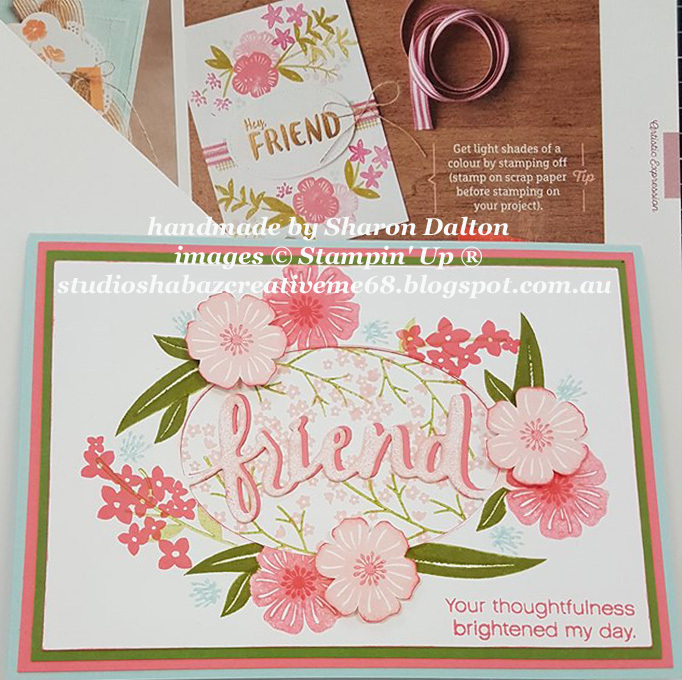 So PINTEREST became my best friend there for a while. 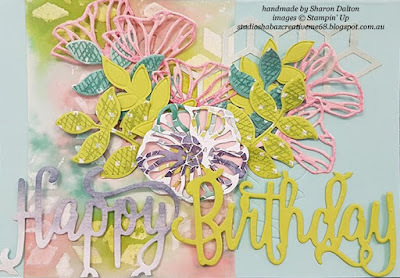 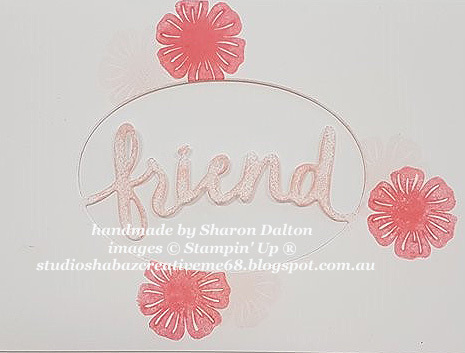 That was until I stumbled upon this card, so my inspiration was drawn from Karen Taylor Stampin' Up Demostrator France. 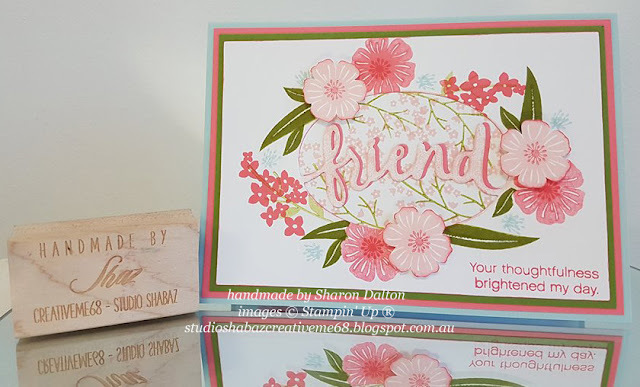 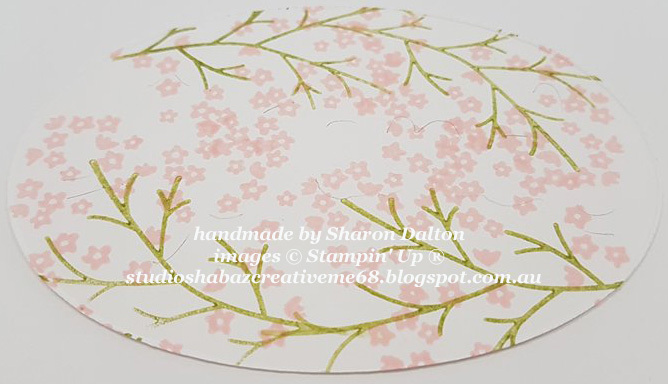 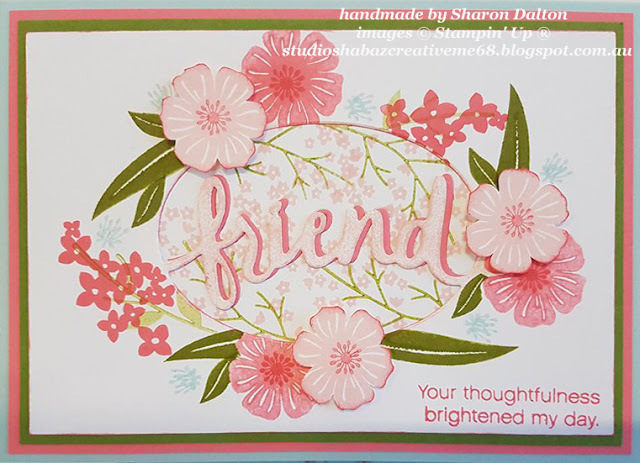 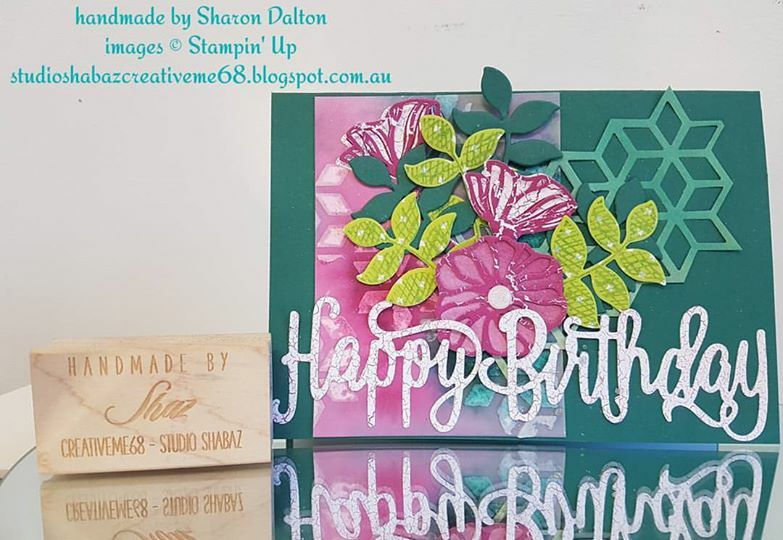 Karen was inspired to create her card from Lou Kitzelman Stampin' Up Demonstrator here in Australia whose blog you have just left to come to mine. 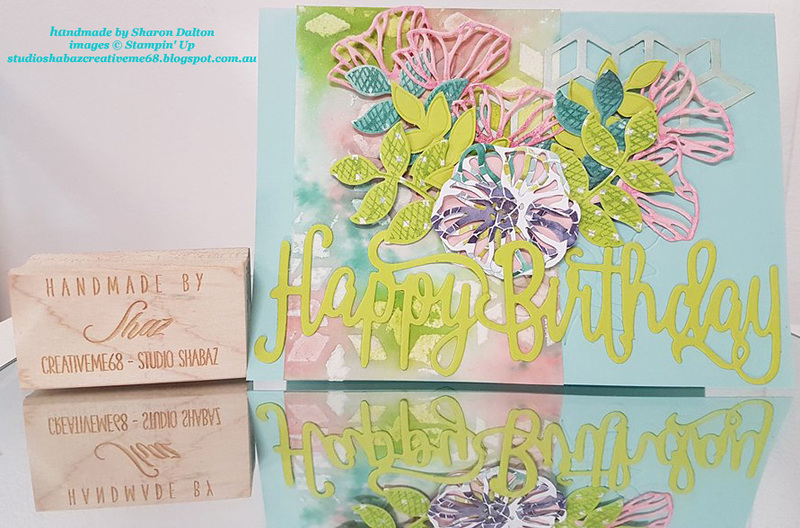 I chose Naturally Eclectic DSP from the new Annual Catalogue, as it already had leaves printed on it for my background....AND then of course I had to use my favourite cardstock - Lemon Lime Twist from the new In Color Collection 2017-2019. 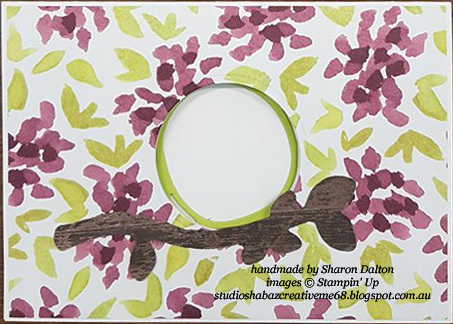 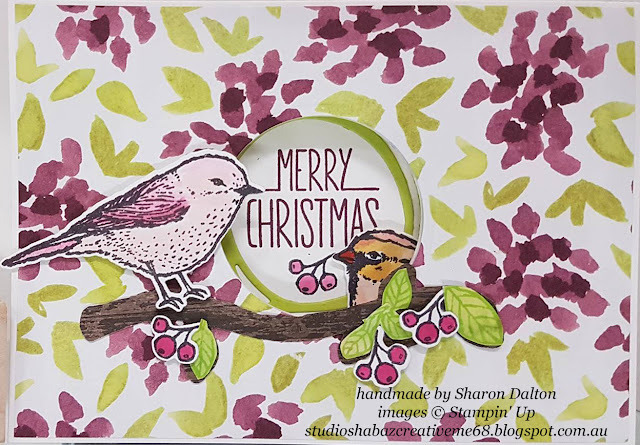 I used a variety of Circle Layering Framelits to cut middle out of the card and Swirly Scribbles, Birds and Blooms Thinlits to create the branch, leaves and berries and the wreath (which is hidden, until you open the card). 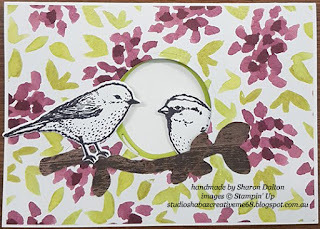 I stamped the birds from the Best Birds stamp set with Black Archival ink, they were cut out with the Bigshot using a matching die from Birds and Blooms. 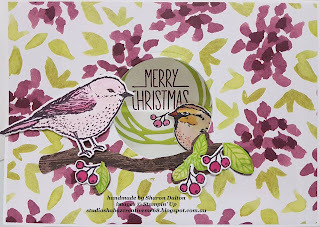 I coloured the birds with Aqua painters and small amount of ink from our pads. 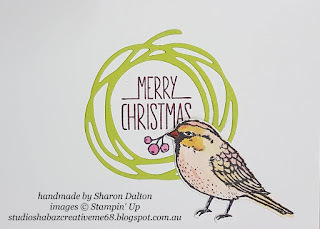 I always take photos during the process of placement of my cards so that I can look back to compare the changes....Added a sentiment to the middle of the card, Merry Christmas came from Better Together stamp set. It makes such a difference, now that the branch has leaves and berries on. 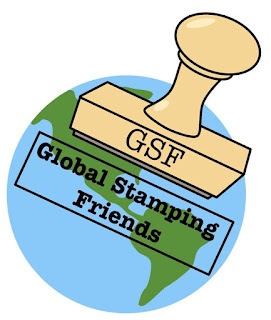 All these stamps can be found in Best Birds set. Lets add a splash of colour on these birds now. 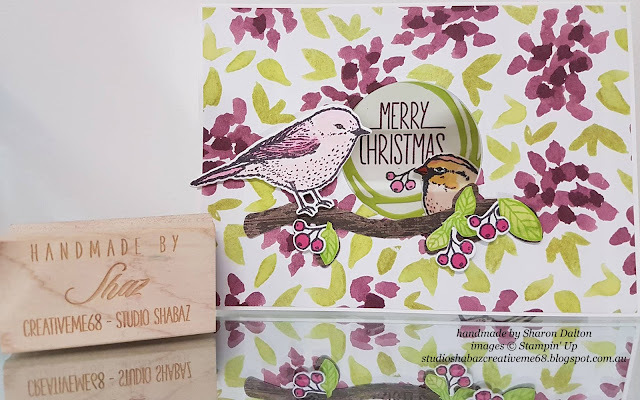 I used Delightful Dijon, Cajun Craze on the bird inside the card and In Color 2017-2019 Inks Berry Burst and Powder Pink. 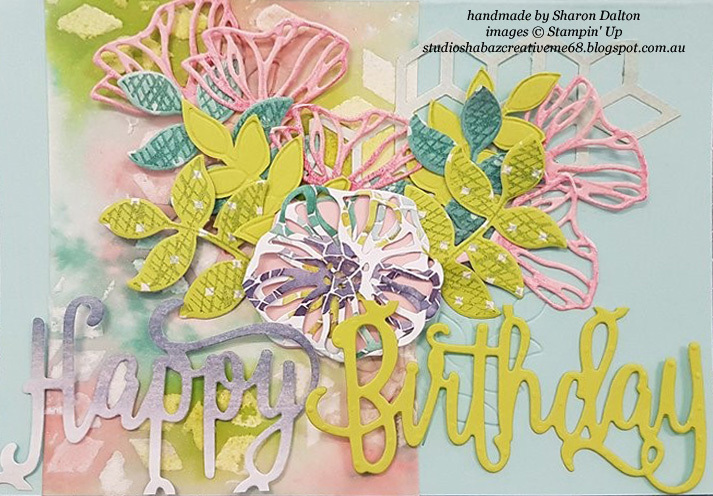 Decorating the inside of the card is something new that I am trying to do this year when making cards...LOVE the surprise when you open the card!!! I actually think that I nailed the brief, hope you all try making Christmas cards without Christmas/Holiday stamps....YAY!!! 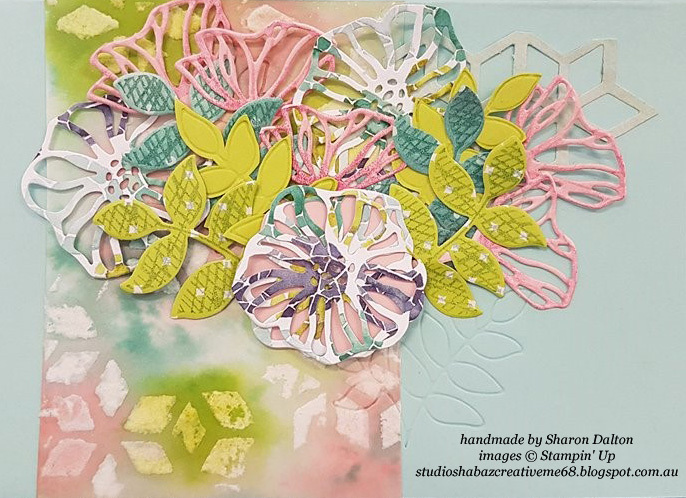 Another creation from CreativeMe68 - Studio Shabaz.